PATS collaborated with other healthcare providers to educate the public about diabetes. The group of athletic trainers (ATs) that attended the event explained to the public the ATs role in the care of diabetes in the athletic population while providing information on reading nutritional labels. 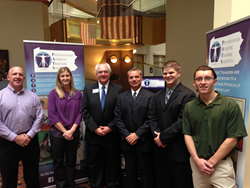 The Pennsylvania Athletic Trainers’ Society (PATS) participated in the World Diabetes Day event held at the state capitol in Harrisburg on November 18th. The event featured Pennsylvania chefs as its keynote speakers, including Executive Chef Pippa Calland of MidSt8 Taco and Manuel Torres of El Serrano. The speakers shared healthy recipes for anyone living with diabetes. A proclamation signed by Governor Tom Wolf declaring November as Diabetes Awareness Month was presented at the event. PATS discussed the role of athletic trainers (ATs) in the care of diabetes in the athletic population while providing information on reading nutritional labels. Diabetes is a chronic disease that can occur in two forms, either the pancreas does not produce insulin, resulting in type 1 diabetes or type 2 diabetes that occurs when the body is not producing enough insulin and/or the body cannot use the insulin that is produced. Insulin is a hormone that helps convert sugar and starches from food into energy. "Although the cause of diabetes is uncertain, genetics and lifestyle factors, such as obesity and a lack of exercise, can play a role", said Secretary Murphy. "Type 2 diabetes can be prevented or delayed by healthy eating habits and regular exercise. For those who already have diabetes, it is important for them to manage the disease by monitoring what they eat, exercising often, testing blood sugar regularly, and taking medication as prescribed." Athletic Trainers (ATs) are often the healthcare professionals available on-site, particularly in the athletic settings, on a daily basis to recognize diabetes and provide the necessary care. For those with Type 1 diabetes, the AT will help manage the disease by monitoring their diet, exercise routines, and testing blood sugar regularly and taking necessary medications. Further, ATs can provide instruction on healthy exercise and nutritional habits which can prevent or delayed type 2 diabetes. “World Diabetes Day was a great opportunity for PATS to interact with other health care professionals and the public about the role of the Athletic Trainer in diabetic management and care”, stated John Moyer, PATS President. Of the nearly 29.1 million Americans with diabetes, an estimated 8.1 million people are undiagnosed. In addition, an estimated 86 million adults have pre-diabetes, placing them at increased risk for developing the disease. Symptoms may include frequent urination, unusual thirst, extreme hunger, unusual weight loss, extreme fatigue and irritability, frequent infections, blurred vision, and cuts or bruises that are slow to heal.